After a case of post-holiday blues and the near death of my computer’s hard drive, I thought I should get back into the swing of things with a request from Shintar, keeper of the great SWTOR blog Going Commando. Shintar asked me to take a look at the technical readout we see from Nahut’s point of view during the cut scene introducing this boss from the Gods from the Machine operation. I was eager to oblige for several reasons. First and foremost, I very much welcome suggestions and requests. Second, Nahut is my favorite encounter in the Machine Gods operation. It’s a neat fight against a cool looking boss with fun mechanics in a unique, moody setting. Third, much of the hard work of the translation was already done! 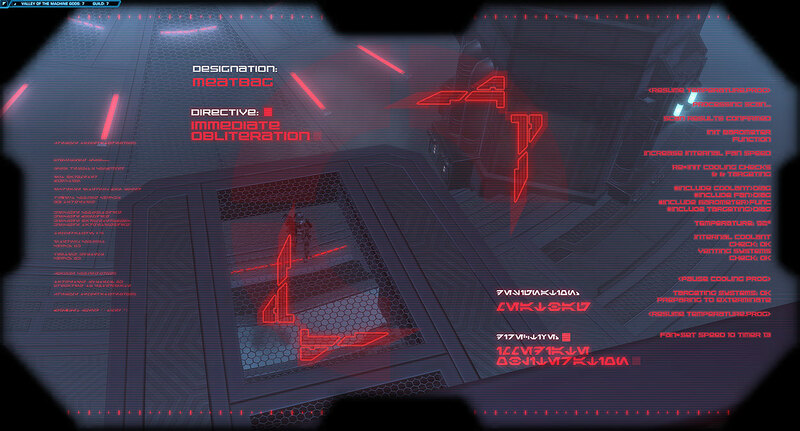 Nahut’s Terminator-style internal readout reuses elements from HK-55’s first person view from the famous musical montage from Chapter 4 of Knights of the Fallen Empire. Indeed, translating the Aurebesh from that scene is what inspired the creation of this blog, so I was happy to revisit it. This also gave me an opportunity to update my original translation, and once again reflect upon the differences between how Aurebesh was designed and how it is actually used. Part of the readout includes appearances of several digraphs that combine two English letters with a single sound (such as “th” or “sh”) into a single Aurebesh symbol. However, it is very rare to see these glyphs used “properly.” Since the key strokes used to type out digraphs are not part of the standard alphabet, it’s far more common to seem them rendered as individual Aurebesh letters. In theory some well known names look quite different depending on how strictly the translator follows the extended Aurebesh alphabet. In the example of Nahut and HK’s technical readout, all the digraphs used here are meant to be read as the symbols to which they are bound on an English keyboard. I believe this display was created using the Aurek-Besh font, and here the the Krenth (kh) and Onith (eo) glyphs translate as the open and closed angle brackets: < and >. This makes sense given the context of computer jargon. I’ve remarked before that the official Aurebesh alphabet is incomplete; it is missing some common punctuation marks, numbers and styles for capitalization. It’s up to the designers and font makers using these fake space-letters to fill in the gaps, and I would never dream of declaring any use of Aurebesh incorrect or wrong. Indeed, I find it interesting to see the different solutions to the problems the numerous artists working with Aurebesh across Star Wars lore have found. In a way, it makes Aurebesh seem like a richer, more living language.